This fun-to-make art project incorporates two items from nature that signify winter in all its loveliness: pine boughs and pinecones. The stamped wreath can be made in traditional reds and greens to display at home or to be gifted to a loved one, just in time for Christmas. Already had your fill of Christmas art projects? No problem! It can also be made with winter colors, all ready to brighten the walls during the cold and bare months ahead. I love this project because it uses REAL pine bough clippings and pinecones along with the usual paint and paper, adding the elements of FUN and DIFFERENT to a standard painting/stamping project. If you are a family that enjoys taking nature walks or doing nature studies, this art project could be an extension of that as well. And while this is primarily a project for elementary-aged children, I’ve included some ideas for making this work for tweens or teens. Have your pine clippings and pinecones gathered in advance. You could incorporate this into a nature walk, gather them from your backyard, or even clip them from your Christmas tree. (We clipped the pine bough pieces from our Christmas tree and got the pinecones from our yard). You’ll want pine clippings with short, dense needles - not the long, pointy ones. If the pine needles and cones are damp, set them aside to dry completely before making your wreath. Clip the pine pieces to less than 6”; anything larger will be unwieldy and will become difficult to dip, paint, and press into a circular shape. Clippings that fork/branch out yield the nicest results. Determine how many wreaths that you want your kids to make. Using the bowl and a pencil, trace a circle shape onto the center of each piece of paper that you are using (make sure that the circle you trace is not too close to the edge of the paper). Spread green tempera paint onto the center of a paper plate in a thin layer. Note: you don’t want a thick pool of paint. Press a pine bough clipping into the paint to cover one side of the bough completely with paint. Use fingers to press all parts of the pine into the paint. You want enough paint, but the pine should not be dripping with it. Then, “stamp” with the pine bough on some scrap paper and experiment to see how it looks. More or less paint might be needed. Once you've mastered the technique, move on to making the wreath. Press the pine in the paint and then stamp with it, covering the circle line. Overlapping the pine prints is a good idea – it will create a denser look. Replace soggy pine pieces with fresh ones as necessary. At this point, you might want to let the green paint dry before the other colors are put on. Once the green part of the wreath is done, repeat the paint stamping process but with pinecones dipped in brown paint. Again, experiment on some scrap paper first. For a CHRISTMAS wreath: Add red “berries” by using red paint to make fingerprints…or, paint the red berries on with a paintbrush. For a WINTER wreath: Add white “snowflakes” by using white paint to make fingerprints…or, paint the white snowflakes on with a paintbrush (variation: use silver or gold metallic paint or glitter paint for some of the snowflakes). Gather the pine bough clippings and pinecones while playing outdoors in the backyard or while on a nature walk. If you do nature studies, sketch and label the pine bough clippings and pinecones in a nature journal prior to making the project. Gather various types of pine clippings and pinecones, if you have them available in your area, and see if you can classify them using a nature handbook before making the art project. Make the wreaths in miniature, using smaller cuts of pine and mini pinecones, on the front of blank cardstock cards to make homemade stationary? 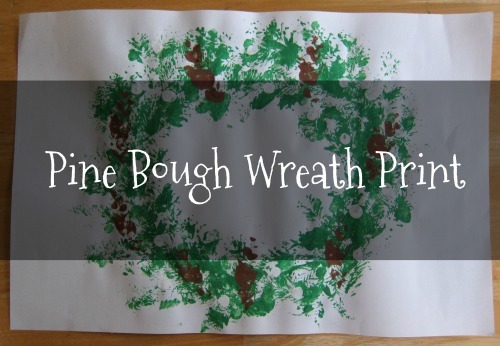 Very young children are more likely to use their pine boughs like paintbrushes instead of like stampers, making their wreaths look smeary and not much like prints. One idea to include them in the project-making would be to cut a wreath shape out of large, green construction paper first and then have them “stamp” with their pine boughs and pinecones on that. 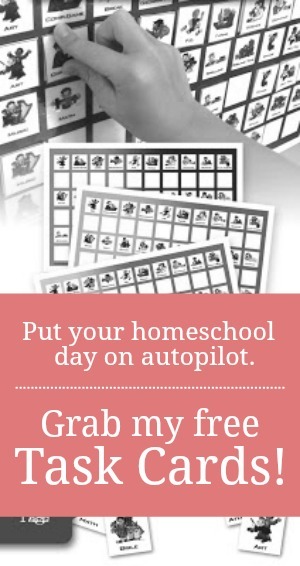 Planning to make this project with multiple younger children (or to make multiple copies)? You might want to take turns working with each child one-on-one or enlist some help. We’ve enjoyed making this project two years in a row. It went very smoothly, and the wreaths turned out beautifully. But both times, my hubby was available to help so that we had two sets of hands to assist. This is a messy project! I really enjoy doing art projects with my children, and I honestly don’t mind messy. Just remember that your children will be wielding paint-covered pine boughs, maybe in your dining room, so be prepared (smile)!...Have fun! OH! Thanks for this tutorial. Really well explained. I appreciate the several possible adaptations for a multiple age project. I will use it to complete our (late) advent nature study walk on the evergreen topic!